The purpose of this overview is to examine and provide a comparative analysis of new technologies and conventional methods for delivering vital cannabinoid nutrients at the molecular level and, more specifically, their bioavailability to optimize response by the human endocannabinoid system. Cannasphere Biotech has developed a proprietary, patent pending liposomal dual encapsulation method called Lipofusion™ that incorporates soluble fibers with liposomal dual encapsulation technology to mitigate many of the common barriers to bioavailability (such as those mentioned above) and other challenges encountered by makers of other conventional and nano-encapsulated products. Scientists have identified 66 major cannabinoids present in all varieties of the cannabis plant, each serving a variety of medicinal/therapeutic purposes by working synergistically to activate key functions of the human endocannabinoid system. These cannabinoids fall into several subclasses including cannabigerols (CBG), cannabichromenes (CBC), cannabinols (CBN), cannabicyclol (CBL), cannabielsoin (CBE), cannabitriol (CBT), cannabidiols (CBD) and tetrahydrocannabinols (THC), among others that are lesser known. The most commonly known and extracted cannabinoids are THC, which produces the psychoactive effect of “marijuana” and CBD, which is found in abundance in the hemp plant. In the last decade, cannabis product makers have developed more precise methods of extracting molecular formulas and isolates utilizing nano-encapsulation and emulsion technology to facilitate improved uptake and bioavailability. Most recently, liposomal dual encapsulation technology has emerged as a very efficient delivery method that makes therapeutic CBD even more bio-available within the body. 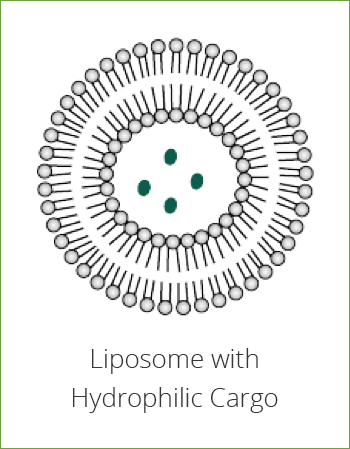 The word “liposome” is derived from two Greek words: “Lipos” (which means fat) and “Soma” (which means body). Liposomal technology isn’t new and has been around since the 70’s. It’s most commonly used by hospitals in the form of intravenous medicine. A liposome is a spherical vesicle resembling a cell with an outer shell comprised of fat-soluble phospholipids that protect the water-soluble actives inside from degradation while en route to their destination. Since these phospholipids are bioidentical to our cell membranes, this outer “shell” functions the same way a human cell membrane does to protect its molecular center and an inner compartment, which carries nutrient molecules. One of the most important functions of phospholipids is to protect and regulate the transport of nutrients through the small intestine and into the blood stream targeting your cells. In this capacity, these molecules work as ‘gatekeepers’ and play an integral role in determining what goes in and out of the cell. How does liposomal delivery supercharge bioavailability? The key to liposomal delivery is in the protective layer of the liposome’s phospholipids. First, it is important to understand the structure of phospholipids, as the holds the key to grasping how liposomes work. In layman’s terms, each phospholipid molecule is made up of a circular “head” which likes water and a “tail” that does not. The heads are attracted to water while the tails try to avoid it, causing the phospholipids to arrange themselves in double layered lines where the heads are all outside, touching water, and the tails are “dry” in the encasement they’ve created. In an aqueous solution (i.e. water), the phospholipids automatically self-assemble into a double layer so the hydrophobic fatty acid tails (which like to stay dry) move away from water and turn inward; whereas the water-loving phosphate head moves toward the liquid by turning toward the middle of the double layer. This results in a closed, spherical structure called a “liposome” with a hollow aqueous core surrounded by a double-layer (bi-layer) membrane, which encapsulates active CBD and other nutrients into these microscopic vesicles and protects them from degradation and hydrolysis in the bloodstream until they are fused into the cells. The contents of conventional products undergo decomposition at many levels in the digestive system, thus resulting in wasted nutritional value. Studies have shown that most nutritional products taken orally lose up to 90% of their nutritional value during the digestive process. The body’s digestive system is designed to release enzymes that break down food to extract nutrients from food. While it works well to break down food for absorption, the destructive nature of the digestion process can degrade the vulnerable, microscopic actives in nutritional products before the body gets a chance to assimilate them. This can greatly limit effectiveness and decrease nutritional value of the products. Nutrients carried or encased with binders that help them to survive digestion long enough to enter the blood stream can be subject to attack by the white blood cells, which seek to destroy foreign substances in the course of normal immune responses. These factors can also reduce the absorption rate and bio-availability of actives, resulting in wasted nutritional value. Products and drugs utilizing nano-emulsion and encapsulation technology to deliver nutrients can vastly improve absorption and bioavailability over conventional delivery methods. However, if they are not encapsulated with fat-soluble outer coatings, they can be unstable and equally vulnerable to degradation upon exposure to digestive enzymes and phagocytic action. In fact, encapsulating products with single layer membranes instead of phospholipids doesn’t protect the products at all. They are immediately absorbed wherever they enter, making it difficult to sustain proficient delivery of actives. Some nano-particles also trigger an immune response from white blood cells which decreases the amount of time the nutrients stay potent within the body. This is referred to as the (half-life) which measures the concentration of a substance in the body. The most interesting and beneficial innovation of our patent pending Lipofusion™ technology is that our vesicles utilize a dual encapsulation process to encase CBD actives within phospholipids that are bio-identical to the membranes that surround human cells. This allows the liposomes to easily target cells on a molecular level, delivering nutritional payloads directly to the bodily tissues that need them.